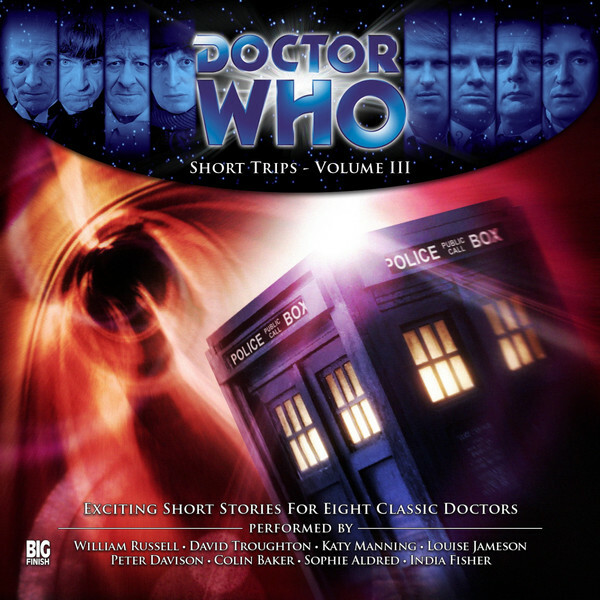 In 2010 / 2011, the Doctor Who Short Trips range was a regular (every few months) set of two CDs brimming with short stories read by a range of actors, for all the licensed Doctors and written by a kaleidoscope of writers. For no clear reason, I’ve decided to commence reviews with May 2011 and Short Trips Volume III. These are great value and most listeners should find something to enjoy. The first story, Seven to One by Simon Miller is read by Nick Briggs except near then end when William Russell takes over. It is a (very) tongue-in-cheek story acting as a filling around every other story. It splits into seven parts, one for each Doctor running backwards in sequence (unlike the inner stories). Each involves the Doctor solving a puzzle. A nice construct, but I kept expecting the inner stories to connect somehow. They don’t. The first inner story is Kate Orman’s The Five Dimensional Man read by David Troughton. This gives us Zoe popping into a 1950s kitchen and taking a housewife on a trip into her world where the Second Doctor and Jamie need help defeating their latest foe. The 1950s mood is a nice element, and the story entertains. The second inner story is Dave Curran’s Pop Up. In this story, read by Katy Manning, Jo Grant experiences the downside of advertising and brings mayhem to the TARDIS. She has to help the Third Doctor put things to right. While I enjoyed it as an amusing listen, it made some presumptions about several TARDIS systems that while funny don’t stand the test of time. A minor point. The third inner story is Juliet Boyd’s The Wondrous Box. Although read by Louise Jameson, the Fourth Doctor’s companion is Sarah Jane Smith, and for my money Louise does convey Liz Sladen rather well at times. The story centres on a visit to PT Barnum’s circus and an elephant. A perfectly formed tale it has drama, humour and an ending that gives pause for thought. Fourth is Mathilde Madden’s Wet Walls read by Peter Davison. This is a Fifth Doctor and Peri story set in a strange house where something is wrong but the Doctor can’t observe it for himself. A somewhat grisly setup with a happy ending. For the fifth story we have a team effort. M Deacon, J Middleton and C Wraight (why so many for a short story?) give is the Sixth Doctor in Murmurs of Earth. Read by Colin Baker, Peri and the Doctor find themselves on a planet full of holograms in need of a personality upgrade. The core of this is a spin on a motif used many times elsewhere (eg in Star Trek: the Motion Picture) but that doesn’t detract from the story. Sixth and it’s an Andrew Cartmel tale, The Riparian Ripper. Read by Sophie Aldred, the Seventh Doctor and Ace try to get to the bottom of a series of brutal attacks and have to face local suspicion and prejudice. The twist was rather obvious but as most of this story is about dealing with the consequence of easy decision making. The ending touches on missed opportunities and is very much of its era. Finally the Bev Conway Eighth Doctor story All the Fun of the Fair. India Fisher gets her teeth into many voices for this tale of misplaced Doctor and misappropriated TARDIS and also gets to be Lucie Miller! It’s fun and leaves you wanting a little bit more.